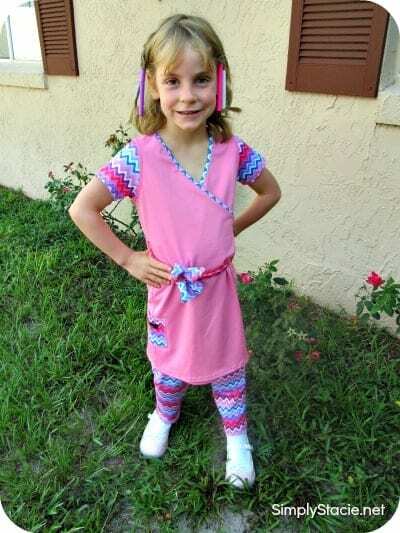 “Pleassseee Mommy, Can I wear my pretty Zupers outfit for the show?” My five year old daughter was getting dressed to perform in a show at her Vacation Bible School and she was begging to wear her very stylish outfit from Zupers. Later that evening, Hannah proudly sang and danced while feeling confident in her lovely and colorful Zupers Faux Wrap Dress and Leggings! Zupers has a wonderful selection of activewear designed just for girls that is super stylish and very comfortable making it perfect for everyday wear. From dresses, tunic tops, leggings, Capri leggings and shorts there is something special to add for every girl’s wardrobe. As a mom, I really appreciate that Zupers are designed to be durable with the added bonus of a hidden kneepads and rip resistance. We live in Florida, so I was also impressed to learn that Zupers clothing offers UV protection of 50+ from the sun’s rays too. Hannah has a skin condition, eczema so we have to be careful about the fabric of her clothing which can irritate her skin. She loves her Zupers because the fabric is very soft and does not cause any irritation or discomfort to her skin. The Faux Wrap Dress ($38) is a burst of pretty colors that is so cute. The wrap part stayed closed at all times thanks to special stitching and is perfectly paired with Zupers Capri leggings ($28). There are a variety of styles to choose from in neat designs or fun solid colors. Girls of all ages from 6 months to 14 years can find cute, durable and affordable styles at Zupers. You are invited to visit the Zupers website to shop for your favorite styles which are perfect for back-to-school! The halter dress is cute. I like the Missoni SS Wrap Dress. I love the floral Long Leggings. Cute! I think the faux wrap is my fave! I like the faux wrap dress. Cute! I like the bubble gum pink dress. My Hannah Loves the Missoni SS Faux Wrap Dress. I LOVE the hidden knee patches. My daughter loves girly things but is also rough and tumble. I am always patching holes in knees. The Capri Leggings are my favorite. I like the FAUX WRAP DRESS in the ric-rac design. I love the Faux Wrap Dress in the Bandana design! I like the capri leggings!! I love the faux wrap dress! i like the orange halter dress! My favorite is the CAPRI LEGGINGS. I really like the isabella blue leggings. The colors and pattern are so fun! The Faux Wrap Dress is my favorite. I also like the Racer Tank Tunic. The Faux Wrap Dress looks very nice!